Over the past 30 years, The Law Offices of Judy M. Guice has established itself as one great name in Mississippi law, offering competent, compassionate and knowledgeable legal representation to plaintiffs in a wide range of civil litigation cases. With an emphasis on personal injury and insurance bad faith, Judy Guice successfully tackles auto accidents, product liability, premises liability, economic loss, wrongful death and other legal matters. Attorney Judy Guice is listed in the Bar Register of Preeminent Lawyers and she holds the highest rating, AV Preeminent*, from Martindale-Hubbell. In 2010, her peers chose her as Outstanding Mississippi Woman Lawyer of the Year. Ms. Guice has also been elected as a fellow of the Mississippi Bar Foundation, which is an honor that only 10 percent of Mississippi lawyers receive. The law firm has won recognition and media attention for successfully arguing various high-profile cases. One of these was Corban vs. USAA Insurance, a landmark case before the Mississippi Supreme Court involving Hurricane Katrina victims whose insurance claims were wrongfully denied. Ms. Guice also served as a tough yet compassionate advocate for clients harmed by the Gulf oil disaster. Located in Biloxi, The Law Offices of Judy M. Guice also proudly represents clients in Gulfport, Ocean Springs, Harrison County, Hancock County, and Jackson County and all along the Mississippi gulf coast. The law firm offers free initial consultations for all personal injury and insurance bad faith cases. *AV Preeminent and BV Distinguished are certification marks of Reed Levier Properties Inc., used in accordance with the Martindale-Hubbell certification procedures, standards and policies. Martindale-Hubbell is the facilitator of a peer review rating process. Ratings reflect the anonymous opinions of members of the bar and the judiciary. Martindale-Hubbell ratings fall into two categories — legal ability and general ethical standards. 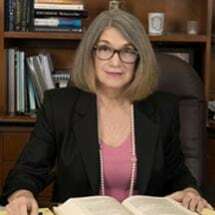 Judy M. Guice brings over 30 years of experience to the table as a competent, compassionate, and knowledgeable advocate for clients in a practice that focuses on civil litigation primarily in the areas of personal injury and insurance bad faith. Judy Guice has successfully challenged insurance companies who refuse to honor their contracts with their policyholders. A company is not allowed to sacrifice safety to profits. Unfortunately, companies sometimes cause needless danger by manufacturing unsafe products sold and used by the public. Attorney Guice has the experience to prove the extent of your injury and the negligence of the parties who are at fault. Judy Guice understands the tragedy of loss and compassionately advocates for your rights and the rights of your loved one. She will investigate the cause of the loss and take appropriate action on your behalf.